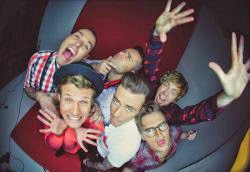 The McBusted revealed yesterday (27) during a visit to BBC radio - Radio1 the next single from their debut album. "Get Over It" released as a promotional single from "air guitar", which will be released next Monday (1) in the UK, also preceded by songs "What Happened To Your Band" and "Hate Your Guts". The group, formed by members of McFly and Busted, will come out on tour again in 2015.